The PPL8 temperature sensor incorporates a pocket as well as a spring loaded insert which allows it to be withdrawn extremely easily without breaking into the process line. 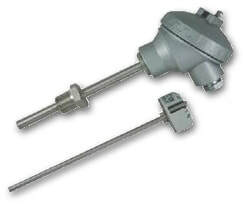 iCenta can supply the sensor stem with any immersion length and process connection to meet exact requirements. A lagging extension can also be specified and with various options available for the terminal head, including IP68 stainless steel versions, we are sure to satisfy all of your requirements. The IC-PPL8 Temperature Sensor incorporates a pocket as well as a spring loaded insert which allows the sensor to be withdrawn extremely easily without breaking into the process line.